The holidays are right around the corner, and shipping carriers are already backed up. Although our current shipping deadline is 12/20 at noon EST, we highly recommend placing your order ASAP. Black Friday & Cyber Monday really put our shipping carriers in the weeds, and they’re still trying to dig out. We want to be as transparent as possible with shipping, so here’s a breakdown for you. The first step in shipping out any order is processing (also known as handling). Lucky for you, we’re wicked fast. Out staff is here early mornings, late evenings, and weekends to make sure we’re getting your orders out. For the most part, any order placed before 1pm EST will leave our warehouse the same day. But it’s important to keep in mind that sometimes they will leave the warehouse the following business day, or even the day after that. We recommend factoring in 1 business day to be safe. Also – if you place your order on a Saturday or Sunday it will not leave our warehouse until Monday afternoon. Our shipping carriers do not pick up on the weekends. If you choose standard shipping on your order, we will choose the lowest cost carrier. 99.9% of the time this means it will be DHL or USPS. Normally, these orders have 3-5 transit days, but with increased volume we are seeing deliveries taking longer. If you order is time sensitive (10 days or less) we highly recommend choosing Priority or Express shipping. Priority shipping will ship via USPS Priority Mail, or in rare cases UPS if the transit time beats USPS. USPS guarantees delivery within 1-3 days depending on where you live. To find out how many days it will take, visit USPS’ website here and enter 01801 for the zip code. USPS puts priority on these packages over first class, so we highly recommend this option if you need your package within 10 days of ordering. 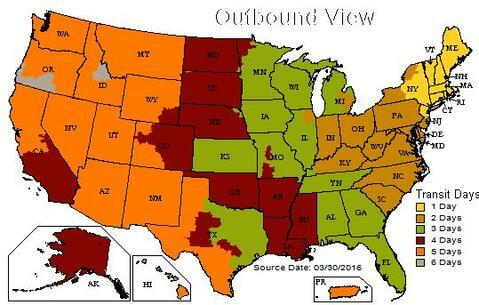 Express shipping ships via USPS and will arrive almost anywhere in the country within 1 business day. If you live in a rural area, please note that it may take up to 2 days for your package to arrive. If you do not see Express shipping offered at checkout, shoot us an email and we’ll figure out a solution with you. We understand that this can be a stressful time of year. We also understand that you place a lot of trust in us to get you your order on time. If your order is late, is marked as delivered but not there, or seems to be lost in transit, please send us an email asap at help@chowdaheadz.com. The sooner you email us, the sooner we can work out a solution. You’ll usually hear back from us in a few hours. You can also reach us via Facebook Messenger!